Hey darlings! I did a similar post to this a while ago I think but since it's been ages since I really addressed this situation I thought I'd do another one with a similar message. When someone says "Burden to bear" I'm pretty sure an idea comes to your head about something which you consider to be your burden. Maybe exams or something you don't like about yourself or something you don't think you're as good as everyone else at. At times it kind of feels like you're alone it that too I think. I know when somethings getting me down it kind of over takes everything I do. 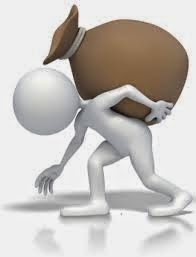 Sometimes the burden is temporary for example exams or an interview but sometimes it's not to temporary and you can physically feel the weight of the burden moving from one day to the next. It's these type of burdens that make you feel like you're the only one in the entire world who has ever felt this crap. One of the most comforting things to remember is that everyone at one stage in their life has felt like the weight has become too much and someone somewhere has had the exact same problem as you. You are not alone. Even the most seemingly perfect people have their burdens too, they have things which will get them down and make them feel bad on a day to day basis. Everyone has something they wish they could change. Life's not about who "has it worse" because if a problem is big to you it's still a problem even if to someone else it would be minimal. For me I get anxious meeting new people but for some people thats no biggy. That doesn't make my problem any less of a problem so don't let anyone tell you and don't tell anyone that what they're upset about isn't big or isn't as bad as your problem, trust me they don't need that. Its easy to forget that so many of us go through similar problems and that makes us stronger somehow. It's also easy to forget the stuff we are good at. You want to have someones hair but they might want to have your talent in art and so we forget that actually there are things that we all dislike and like about ourselves. All of us have our burden to bear and that's okay, it's humane. I've never met anyone whose 100% happy with everything and I don't think we ever should be, because then we'd have nothing to strive towards. So remember that we all have something that we have to carry through life but in the end, it makes us stronger and builds us as a character. Remember no matter what you're burden is, I have full believe that you can carry it.